I am so excited about this guest post today! Rob Blackwell is the author of A Soul to Steal, (see my review) which is an amazing paranormal thriller! Today we are all in for a treat because Rob is going to share a deleted scene from his spooky tale. I hope you enjoy it as much as I did. Tim Anderson sat in his living room, waiting to die. His chair faced the apartment’s front and only door. He was gripping a loaded shotgun that lay across his lap. Tim had spent the better part of an hour barricading the rest of his apartment, ensuring there was no other way in. Still, he worried Lord Halloween would find another entrance, some secret and hidden passage that Tim did not know existed. Such was his fear of the murderer that a part of him wondered if Lord Halloween could do things no human being could do. Maybe he didn’t need doors or windows. Could he even walk through walls? Was he some kind of phantom, as people said? It would explain why the police could not catch him. But Tim didn’t really believe that. Deep in his heart, he knew Lord Halloween was just a man. Yes, he was smart, cunning, deceitful—and certainly evil—but Lord Halloween was human. He wanted others to think he was a demon, but Tim knew the truth. It must be Nov. 1 now, Tim thought. He refused to glance at the clock to confirm it was past midnight, however. He could not bear the idea of taking his eyes off the door. What if Lord Halloween came through? What if he was waiting for just such a moment of weakness? No, Tim would sit right here, waiting, watching. And Tim had begun to wonder if he was right. Tim had struggled to report honestly about the increasingly grisly series of events—without driving people toward blind panic. More and more, he worried he had done more harm than good. The serial killer had said he wanted to reclaim Halloween, make it his own. And he had succeeded. No one in Loudoun will dare celebrate All Hallow’s Eve again, Tim thought. Not after what happened this month. Perhaps as repentance, Tim had taken a stand at the end. A grim smile flitted on his lips as he stared at the door, barely blinking, his hands never slackening their grip on the shotgun. Tim Anderson had finally called out Lord Halloween. “He could have played a part in this world, but he has chosen to hide in it,” Tim wrote in what he knew would be his final work. “He strikes at us because there are things he doesn’t understand: love, compassion and empathy. They have always been alien to him. He mocks them with his actions, but the truth is something he must know: he envies us. We experience feelings he can’t know or express and he hates us for them. He is a creature to be pitied, not feared. He is alone in this world and always will be. When we pick up the pieces of our lives, we will go on loving, caring and empathizing. We can hope we will learn from this miserable experience and stand stronger against the things that would tear us apart. He, however, will be by himself, lost in a world he cannot fathom. It was a victory, Tim knew. A hollow one, though, since he would die for it. But there are worse things than death. He could have gone out begging for his life or turning on his fellow man, but at least he had not done that. Even as that thought passed through his mind, he heard something brush against the door. His heart raced. In a flash, he was out of the chair, raising the shotgun to his chest, his finger on the trigger. He waited anxiously for whatever would come through the door. Tim Anderson’s time had finally come. But he was ready. God help him, he was ready. 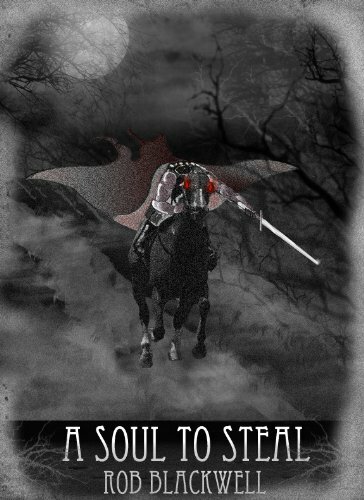 To discover Tim Anderson’s fate—and the identity of Lord Halloween—be sure to read A Soul to Steal. For more information, please “like” the Facebook page. Click to buy it for Kindle or Nook. Rob Blackwell is a journalist who currently serves as Washington bureau chief for American Banker newspaper. A native of Great Falls, Va., he has worked as a reporter for the Loudoun Times-Mirror, Eastern Loudoun Times and a columnist for the South County Chronicle. He recently published his first novel, "A Soul to Steal," set in Loudoun County, Va. He has won several Virginia Press Association awards and was co-winner of the Jesse H. Neal Award for Business Journalism. He lives in Virginia with his wife and two children. A Soul to Steal eBook Giveaway! Winner must contact me with mailing address within 48hours of being chosen or give up prize to next chosen winner.